Today's Russia is not the Soviet Union and there are far more people now than before who would like to see a thaw in relations. Russia has experienced three or four serious crises in its relations with the West over the past 100 years. How did each of those Cold Wars end? With a thaw. How will this one end? The same way. Not one attempt to put pressure on Russia has ever worked. And it is not entirely true that the Soviet Union "lost" the most recent Cold War when it collapsed. Internal problems caused the collapse, not external interference. Such outside pressure only consolidates the Russian people. It is just that the Soviet empire came to the natural end of its life and sunk into oblivion, as happened before to the Russian, British, Spanish, Austro-Hungarian and German empires. 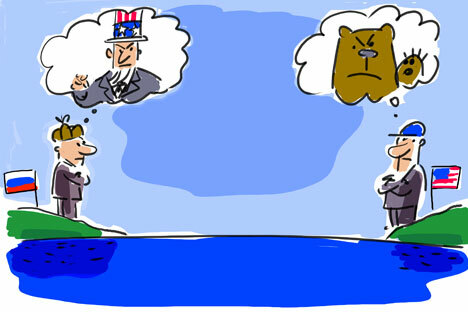 U.S.-Russian relations first "caught cold" immediately following the failure of Western intervention in Soviet Russia. The quintessence of the first Cold War was the so-called Colby note of Aug. 9, 1920. It attempted to define a comprehensive American policy toward the Soviet Union and denounced the Bolshevik regime as something abnormal and contagious and advocated quarantining Moscow. However, the Colby note left the United States a small loophole for private initiative, apparently in the hope that the market would bring the Bolsheviks to their senses. In fact, the market did play a role, but far from the one that Washington had intended. As it turned out, monetary interests proved more powerful than political interests. As early as 1926, "visitors" from the United States appeared in the fields of collective farms in the Volga region: Fordson-Putilovets tractors. What's more, Moscow and the Ford Motor Company planned long-term cooperation right from the start. And that is exactly what happened. Ford not only delivered more than 20,000 tractors to the Soviet Union, it also helped build the Gorky Automobile Plant (GAZ), a giant of the socialist economy. And in the 1930s, Ford even sold the Russians the documentation for the "Christie" tank that domestic engineers used to create the BT family of tanks. Thus, the first Cold War ended in close cooperation. The cause for the second Cold War was the Soviets' expanding postwar influence in Eastern Europe — although no one forced the Western Allies to delay the opening of a "second front." The second Cold War was largely a repeat of the first, only this time it started with a speech by former British Prime Minister Winston Churchill. And taking the place of Ford were Occidental Petroleum and Armand Hammer, winner of the Soviet Union's Order of Friendship of Peoples. However, Hammer had actually begun collaborating with Vladimir Lenin and ended by kissing former Soviet leader Leonid Brezhnev. So that Cold War also ended with tensions winding down, as well as with the appearance of the Organization for Security and Cooperation in Europe (OSCE) that today is trying to enforce a settlement in Ukraine. In short, after a long frost came the customary thaw. The third chill in U.S.-Russian relations began when the Soviet Union sent troops into Afghanistan in 1979. Was the Politburo guilty for this? Two decades ago, the answer would have been an immediate "yes." Today, however, with aggressive Islam enflaming one region after another, it seems the Soviet authorities were not far off base in making that first attempt to confront it. True, they conducted that war in Soviet fashion and in pursuit of their own interests, but at least they made the attempt. Finally, the memoirs of former U.S. National Security Adviser Zbigniew Brzezinski show what an irresponsible role the United States played in the region, which leaves the question open as to who is mainly at fault for what happened there. And the same ambiguity exists with regard to the West's current crackdown on Russia. Once again, we should hold no illusions. The Soviet Union did not hang itself out of grief under the condemning glare of Western politicians. It died in its bed, a senile old man with chronic illnesses. That fate first claimed former Soviet leaders Leonid Brezhnev, Yury Andropov and Konstantin Chernenko — and finally, the whole Soviet Union. Who is to blame for the fact that Ukraine has become a new bone of contention? In my opinion, many are at fault — primarily, it is the Ukrainians themselves, but also Washington, the EU and Moscow. However, the West has once again made Russia the scapegoat, and is again trying to isolate it. But the truth is, that sort of perseverance befits a more worthy cause, especially because today's Russia is not the Soviet Union and there are far more people now than before who would like to see a thaw in relations. What's more, today's geopolitical map includes not only the West, but also a very powerful East, and a warm and inviting wind is blowing on Russia from that direction. And finally, at issue here is not only the West's desire to cash in on the huge Russian market. It is just that the West repeatedly confronts the fact that the world is incomplete without Russia, and that it ignores Moscow "at its own peril." As before, both sides will have to negotiate to break the current impasse. Of course, that will require patience. But a thaw will inevitably come. History guarantees it.